Now if you are one of those people with really huge closets (or maybe just a more reasonable amount of clothing...), this probably isn't an issue for you, but for me, swapping my spring/summer clothes out for fall/winter clothes is a full day's worth of effort. I meant to do this a few weeks ago, but thanks to Georgia's annoying weather (one day it rains, the next it's 50 degrees, the next day its 82 degrees) it's kind of hard to do a full swap for fear of the moment your short sleeved shirts and flip flops are put away you'll be forced to dig them out due to some random summer-like weather. This weekend, I am determined to do it. It's November people. I want to wear cute sweaters and boots and my trench coats. I want to layer and accessorize with scarfs. I want to drink hot chocolate without having the air conditioner on. Okay. sorry for the melodramatic rant... back to the point of the post. That's when I stumbled across this lovely over on Urban Grace. Hello awesomeness. 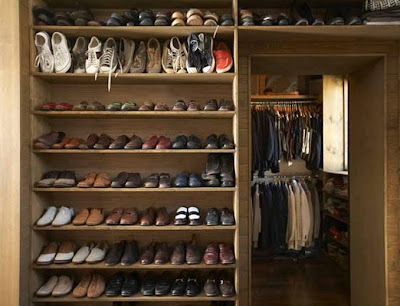 A room just for shoes. Anyone else have closet envy?